Wilmington's first Sister Cities Symposium promises a dynamic agenda of keynote speakers, panel discussions, presentations of in-depth papers and social events. The symposium is hosted by the Wilmington Sister City Commission and the Sister Cities Association of Wilmington; a task force co-chaired by Dale Smith and Kim Hufham is planning and implementing the event, which is designed for international and domestic policy makers, business and community leaders, researchers, and educators. Invited speakers include: Mayor Joe Riley (Charleston, SC) will discuss leveraging sister city relationships and how the Spoleto Festival put Charleston on the map; Phillip J. Kirk, Jr., Director Brady Energy will focus on the importance of leadership; and Keith Crisco, NC Secretary of Commerce will address North Carolina’s role in world markets. 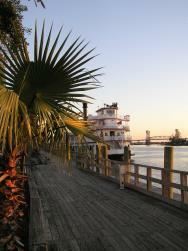 The Hilton Wilmington Riverside is the headquarters hotel for the symposium, which will open with an outdoor evening reception Sunday, April 15, on the hotel's riverfront terrace. Other events will be held in Wilmington's Convention Center, including breakfasts, luncheons and a banquet as well as two and a half days of speakers and panel discussions. Community partners include the Greater Wilmington Chamber of Commerce and the Wilmington Chapter of the North Carolina Trade Association. The event will also offer opportunities for business to business meetings for attendees interested in expanding their markets domestically or internationally. Symposium attendees will choose between programs in two general tracks running simultaneously: education and economic development. For complete program information or registration procedures, please click on the links below. The Sister Cities Association may offer financial assistance to participants registered for the symposium on a needs basis. Financial aid is limited and will be awarded on a first come, first served basis. Aid applications must be sent in with your registration. "International visitors, as well as others from outside our area, will see what Wilmington offers as a business, cultural, educational and tourism center. Attendees from the Wilmington area will benefit not only from the outstanding program, but also from the opportunities to meet with international peers." 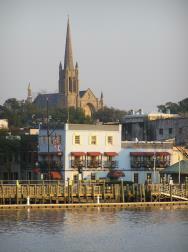 Wilmington, North Carolina is home to the North Carolina Azalea Festival. The Festival is a celebration of Wilmington’s exceptional artwork, gardens, rich history and culture during its five days of entertainment that includes: a parade, street fair, circus, concerts, pageantry, and all that is Southern. Key events over the weekend will include Friday (April 13) afternoon Garden Party in historic Azalea Gardens, Friday (April 13) night concert, Saturday (April 14) parade, street fair and garden tour.